Rich Constantine became a viral sensation last week by participating in Drake's "In My Feelings" Challenge, which was cleverly called, "In My Fillings". GREENVILLE, S.C. — Dr. C is back with a new dance challenge. 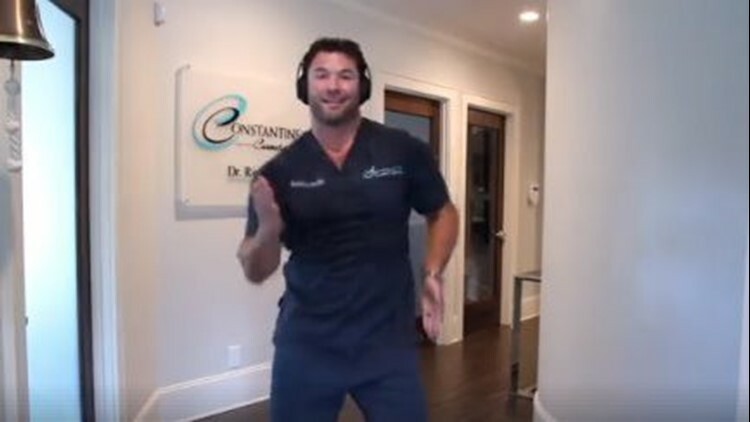 The Greenville, S.C. dentist broke the internet, again, Thursday with his rendition of Ciara's "Level Up" challenge. As of Friday night, his new video had more than 5.4 million views, 122,000 shares and 36,000 comments. Rich Constantine became a viral sensation last week by participating in Drake's "In My Feelings" Challenge, which was cleverly called, "In My Fillings". That post had more than 67,000,000 views, 833,000 shares and 241,000 comments as of Friday night. Ciara's challenge has a little more depth to it. She invited fans to bust a move but also share three ways they were going to "level up" or better their lives. Dr. C said his staff pushed him to take the Drake social media challenge in the first place. "We like to do fun stuff to break from the office," he told the Greenville News. "They had asked me (to do this) for a couple of weeks straight, but I was too embarrassed to do it in front of them." He ended up recording the video in secret, while everyone was out to lunch. Dr. C's newfound fame has definitely kept Constantine Dental busy. The day after the first video went viral, the office scheduled 21 new patients, and that was just before noon, according to the Greenville News. Alas, much to the disappointment of his new fans across the world wide web, Dr. C is married. In fact, the Pennsylvania native and his wife, Trish, just celebrated their 13th wedding anniversary as his viral video kept racking up the clicks. Angelia Davis with the Greenville News contributed to this report.